At long last, I hit triple digits in my mileage during the week of 5/17-5/23--103 miles to be exact. This marked the first time since last fall, when I trained for and completed the USA 24-Hour National Championship in Cleveland, that I went north of 100 miles for the week. Last week also marked 13 weeks to go before I line up at the Leadville Trail 100. That breaks down to 11 more weeks of hard training. In the world of 100-mile training, you run as much as you can and try to spend as much time on your feet as possible. It's a far-different game than marathon or even 50K and 50-mile training. When you're training for a 100-miler, you run and run and run, and run some more even if your legs are trashed. Waking up at 4:30 a.m. basically daily, and running after Noah's asleep, is the only way I can get in the miles and put my marriage, our family and my job first. 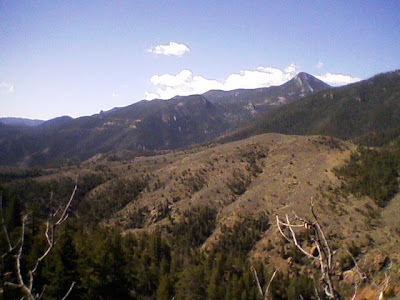 The highlight of the week was a Saturday-morning trail run consisting of a combined 10,000 feet of ascent and descent at the beautiful Deer Creek Canyon with Fast Eddy (a.k.a. Scott Jaime) and Geoff. Fast Ed is a very impressive talent, recently winning the Zane Gray 50-Mile and placing as high as second at the Hard Rock Hundred. His resume is full of wins and top-5 finishes. As I write this post, I'm in the midst of a "recovery" week, which comes on the heels of three weeks of 90, 95, and 103 miles, respectively. But recovery is a relative term. I'm going for 85-90 miles this week, and then next week go for 100-110. At some point in my Leadville training, I'd like to get up to 120 miles. That will require a day off from work--preferably a day spent in Leadville. As I prepare for Leadville, I've registered for two really cool races. 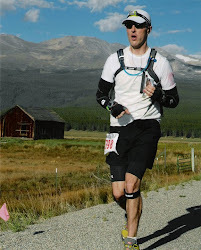 The first is the Leadville Trail Marathon on 7/3. It's run at about 10,000 feet of elevation with a high of 13,000 feet at Mosquito Pass. Unfortunately, it's not run on the 100-mile course, but that's OK. It'll at least give me some valuable exposure to 10,000+ feet. I'm tentatively planning to stay the night after the race and do a 20-25-miler on the course the next morning--and then go home. I'm going to run the marathon aggressively but not at race pace. 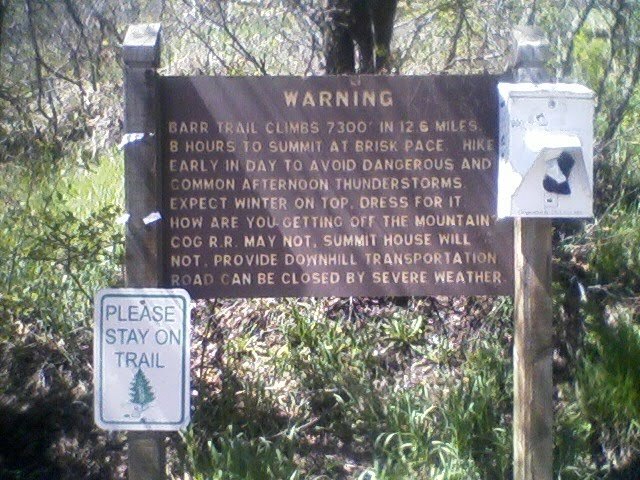 The other race I've registered for is the Barr Trail Mountain Race on 7/18. 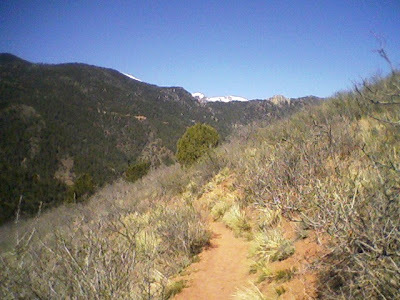 The Barr Trail runs up Pikes Peak and starts at an elevation of 6,570 feet. The race proceeds 6.3 miles up the Barr Trail, gaining 3,630 feet, with the turnaround at Barr Camp, elevation 10,200 feet. The total distance is 12.5 miles. This will be a very difficult race and I'm super-excited about it. The Leadville 100 will feature some of the top ultrarunners in the nation, along with a field of probably more than 500. It will be a big-time event. As a guy who puts his whole heart and soul into training, I'll be there to race. A lot of people may be under the impression that all here in Colorado is peachy with those gorgeous mountains many dream of running. But it's not. This has been a tough transition for us, especially as we're in an apartment and selling our house back in Ohio. A lot of people are helping us throughout this transition--providing love, support and friendship. We're grateful to all who have been there for us. When we take the long view, we can see that life in Colorado will be magnificent. The quality of life here is very good. We both have great jobs. Parker is a nice place to live and raise a family, with excellent schools. The recreational opportunities in Colorado are limitless. The horse riding culture here is strong (good for Anne). And there are many, many spectacular places to run. We'll be OK, but right now we're in a tough spot. I've struggled mightily some days, trying to stay upbeat. Through it all, running has been there for me. Training for the Leadville 100 has helped keep me focused and my mind off our troubles. Run hard and run happy. Since my last post, I've learned a great deal not only about myself but also about running in Colorado. To say "learned" doesn't necessarily mean I've discovered some type of truth. It means I've gotten a better grasp of things out there. First off, during the week of 5/3-5/9, I ran entirely too much on pavement, not getting to the trail once! That was 90 miles on the road, with a few miles here and there on the treadmill. A guy my age can't do that, as reflected in the fact that my knees were aching just a bit by the end of Sunday. But it was all for a good reason. Last weekend we celebrated Noah's second birthday and that--not running--was the priority, so I stayed close to home and ran on the roads. After a week of just road running, I needed some trails. With that said, this past week (5/10-5/16), I planned some exposure to softer surfaces. Throughout the week, I went for dirt/gravel shoulders when it was safe to do so. On Saturday, I ran some dirt roads and dirt/gravel shoulders in and around Parker, logging 16 miles in exactly 2 hours on a pretty hilly course with strong gusts from the south. On Sunday, I capped off the week by venturing down to Manitou Springs to run with the famous Incline Club. I ended the week with 95 miles--not bad for my Leadville Trail 100 training. A few pictures from my adventure are included with this post. A group of nuts who meet most of the year for Sunday long runs on and around Pikes Peak. During the summer months we also meet on Thursday evenings for quality hill sessions. It is the only running club that is more exciting than water on the moon!!! So on Sunday, I did the hour-long drive down to Manitou Springs, the beautiful home of the even more beautiful Pikes Peak, to meet the club at Memorial Park for the start of its 8 a.m. run. I got there a few minutes early and geared up, wearing my North Face fuel belt along with my Nathan handheld to ensure I remained properly hydrated. I also took some PowerBar gels and wore my fast, light and flexible Salomon Speedcross 2 trail shoes, which are hands-down the best trail shoes I've ever worn (Salomon, please do not ever discontinue the Speedcrosses. They are unparalleled!). The weather was beautiful--40s and 50s and sunny with little wind. Anyway, I asked one of the Incline Club members about the route for the day and introduced myself. He was a nice guy, explaining that the single Waldo Canyon loop was about 3 hours and the double was about 4 hours. As I didn't have a limitless amount of time, I elected right then to do the single loop and decided I'd add on in the end if I needed more time and distance. Just before 8:00, Carpenter overviewed the route for the day and asked everyone to sign in (which I did--as a visitor), and we were off--a group of about 40-50. The run took us through the very charming Manitou Springs village and up the historic Ute Pass Trail. We stayed on the UPT, crossing highway 24, and then got on on the Waldo Canyon Trail which took us on a loop. Without reinventing the wheel, the run is described in detail here and I urge you to read the description as its full of great information. I covered 17 miles in 2:54, adding a short section on the Barr Trail leading up to Pikes Peak toward the end. The elevation for Sunday's run peaked at about 8,100 feet in Waldo Canyon. I felt mostly great the whole time, tiring a little in the end but holding up well. I wasn't ever out of breath and climbed the hills with good power and resolve. I hammered a lot of the descents on the "out" but my quads were pretty tired on the "back," and so I ran the descents a little more conservatively on the back. I ran for a while with some pretty fast guys and they were hammering the downhills and putting on an impressive show. They weren't ultrarunners; they described themselves as mountain runners. More on that below. Anyway, I had to stop and pee and they kept going hard (as they should) and I never was able to catch up with them. I ran a good portion of the "back" solo, finishing well ahead of many others. My total ascent and descent was 9,000 feet! Yeah, running solo for so much of the time I was with the Incline Club on Sunday kind of sucked, but it was my fault. I went out aggressively, stayed toward the front and never joined up with others. Next time I may be a bit more social and stay with a larger group so I can meet some folks. When I lived out East, I had mistakenly thought most mountain runners were also ultrarunners. Not so. While it's true there are mountain ultrarunners (as I'm on my way to being), mountain runners who aren't ultrarunners cover shorter distances and they tend to be fast. They have impressive abilities on the inclines and declines. Forgive the generalities--but these are just my limited observations to date. I am beginning to think that, as an ultrarunner, I might just be in the small minority of runners here in Colorado. As I get better-acclimated and know more people over time, maybe that observation will change. I've learned that I have some abilities at altitude. I've adjusted well after a tough initial 2-3 weeks and am handling elevations of 8,000 feet quite well. I now want to venture above 8,000 feet and I think the perfect opportunity will be to participate in the Incline Club's Barr Camp out-and-back, which they'll hopefully do this Sunday. This route will take us up to Barr Camp, which is at 10,000 feet and more than half-way up Pikes Peak--and then we'll come back down. 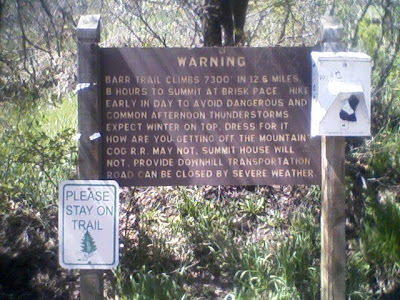 Here's a picture of an interesting sign that greets you at the base of Barr Trail--where you're so full of hope and optimism. Pretty sobering, yes, as it should be. Pikes Peak is no joke; it is serious business. Given my obsession with the ever-mysterious Pikes Peak, you can only imagine how excited I am by the thought of running up to Barr Camp and back especially with the Incline Club. It will be very challenging as you running up a 14,000+ foot mountain! On down the road a bit, my planned summit of Pikes Peak will certainly be a life-changing event. I think it's fair to say I should allot an entire day to that challenge and pack my gear carefully! Barr Camp offers some provisions and over-night accommodations, but I have no plans of a multi-day adventure. It'll be one day--all in one go! I am now thinking seriously about signing up for the Leadville Trail Marathon on 7/3. When/if I do, I'll blog on it! Until then, run hard and run happy! Your average 10 miler at 5 a.m. The alarm goes off at 4:40 a.m. I don't press the snooze button for fear of aggravating my sleeping wife and groggily get out of bed to prepare for my run. It's Leadville 100 season. I step over our awakening dog, Sophie, and proceed into our master bathroom, where I slip into my running garb. By now, the coffee maker is brewing thanks to the auto-timer I set every night before bed. After getting dressed, I ever-so-quietly make my way toward the kitchen in need of java--but coffee is going to have to wait until after Sophie has peed. I ask Sophie to pee quickly, which she does, so that I can get out the door by 5:10 for my my usual 10-mile morning run. Actually, my usual for the morning is about 9 miles, but I'm bumping it up to 10 for my Leadville 100 training. I know what it takes to be ready for a 100, but Leadville is no ordinary 100. It involves snow-capped mountains and elevations of 10,000 feet. So this is just my first run of the day. I'm planning 4 more miles tonight--some might call these junk miles but to me they're more time on the feet in preparation for Leadville. But before any of that can happen, I first need to feed the pets and then I'll enjoy my coffee and English muffin. Through all the hustle of bustle, quietness is of vital importance as any disturbance may awaken Noah. Alas, as I'm enjoying my coffee and waiting for my English muffin to toast to perfection, Noah awakens...at 4:50 a.m.! Now he's crying! I let him go for a few minutes and then finally enter his room to re-cover him in his blankets and give him his pacifier. Even as I close his door he's still crying, but fortunately within a few minutes he's quiet and sleeping again. Thank God! Now for my English muffin! It's 5:05 now and I've downed my English muffin and coffee and a glass of water--all while checking Facebook--and am ready to go. Since it's 38 degrees and windy, I put on my North Face vest jacket, mittens and hat and then my headlamp, red blinker and Road ID and make my way out the door. Damn! I forgot my Garmin! I head back up the stairs to get my GPS and then, finally, am out the door. I start running through the apartment complex parking lots and exit the grounds through the main gate, now making my way down east Mainstreet. My legs are a little tired from yesterday's 14.25 miles (and Saturday's 50-kilometer race). It's only a little dark outside, but too dark to see Pikes Peak to the south. My legs start to loosen up as I cross the ever-busy, always-intense Parker Road, a.k.a., Route 83, and make my way down Mainstreet through the rather charming Parker village. The plan this morning is 5 miles up east Mainstreet, which turns into east Parker Road, and then a return trip to the apartment, for a total of 10 miles. I'll go from about 5,900 feet to almost 6,500 feet for a total elevation change of about 2,000 feet when you factor in a few rolling hills. That may not sound like much but after the 3-mile mark up east Parker Road there are a few decent hills that will give you a nice workout. It's not Green Mountain but it'll have to do this morning. Mountains are for the weekend. Even at this crazy-early hour there are a decent number of cars out--not enough to jeopardize my life but enough to warrant some attention. I feel bad for these folks--having to go to work when they should be at home in bed or out exercising. I'm going up east Parker Road, alternating between the sidewalk and asphalt road as determined by the general nature of approaching cars. I prefer asphalt over concrete sidewalk any day of the week, but nothing beats a good single-track trail. Unfortunately in Parker, they don't know anything about dirt trails. All they know about are asphalt and concrete and they seem to love calling a concrete bike path a "trail." After Riva Ridge Road, which is about 2 miles into my run, the elevation goes north of 6,000 feet as I begin a series of gradual climbs. I'm feeling good this morning and, with it now being about 5:25, the sun is starting to come out and I turn off my headlamp. I can't see the numbers on my Garmin because it's not quite light-enough, but no worries. I look to the south but it's too dark to see Pikes Peak and, besides, I wouldn't be able to see much with all those houses in the way. As I pass Canterbury Parkway, the wind starts to really whip up and I'm now excited that I'm making the wonderful transition from suburban street to country road. Yes, at about the 2.8-mile mark in this route, east Parker Road turns into a fairly quiet, wonderful two-lane road with wide, dirt shoulders perfect for running. By this point, suburbia is behind me and now I can relish the sites--the rolling hills, the pastures, the cows and, of course, the views! I live for running on country roads. At the 4-mile mark, now averaging about 7:35 pace, I come upon Tomahawk Road, a north-south road at 6,200 feet, and by now have seen Pikes Peak to the south. It's still kind of faint but it's there. Since moving to Colorado a month ago, no view has captivated me more than Pikes Peak. It is a spectacular site. I decide to slightly modify my route and turn right--or south--onto Tomahawk. I go about a quarter-mile down Tomahawk and turn left onto East Pinewood Drive. This is probably my favorite neighborhood in the Parker area. It features big lots, beautiful and high-quality but not elaborate houses, and breath-taking views of the mountains to the west and Pikes Peak to the south. I'm certain that the same kind of people who lived in our neighborhood in Chagrin Falls live in this neighborhood--people who love the country, the outdoors, family time and wholesome living. This is where I'd love to live when we buy...if only a house comes on the market that we can afford. Some of the hills in this neighborhood aren't easy but I hold my 7:35 pace as I look south at Pikes Peak. The peak is covered with snow and glows from the sunlight. It is a monstrosity and I can't wait to summit it in a few weeks when the weather is better. I turn left onto North Templin Road, which will reconnect with Parker Road. On Templin, I'm now up to about 6,400 feet but I'm feeling good and breathing normally. I realize that I've come a long way in acclimating to the elevation. Only 2 or 3 weeks ago I was suffering. But now I'm able to handle the elevation and wonder if I'm fully acclimated or if I'm just partway there. I'm only on Templin for about a third of a mile before turning left onto West Parker Road. The time is about 5:52 and it's quiet here on West Parker Road. I have 38 minutes to run the remaining 5 or so miles and get home on time. That's plenty of time. From here, West Parker Road is mostly downhill and so I pick up my pace a little to about 6:50-7:10 per mile. The view of the mountains immediately in front of me is spectacular. I never get used to this view. The mountains farther back--the 14'ers--are snow-covered and, like Pikes Peak, glowing from the sun rising in the east. The next two miles are very pleasant, despite strong winds after Clarke Boulevard. About three miles from home, I now have to again deal with the issues of suburbia and the early morning rush. But there will be no sidewalk running on my return trip. Instead, I opt for the road's edge and step up onto the grass if a car is coming and won't get over for me. Those drivers who seem hellbent on buzzing runners--I feel badly for them. Why the hate? I'm just trucking along as I enter the Parker village now well past the 9-mile mark into my 10-plus miler. The coffee houses are opening and the world is starting a new day. Thanks to cooperation from the Parker Road/Mainstreet traffic light, I'm able to run across 83 with no worries. Ordinarily, I'd take the tunnel under 83 but can instead run across the road this morning since the light is agreeing. After crossing Parker Road, I'm now basically home and am at 10 miles when I enter my apartment complex, having dialed the code to get into the gate. I run in circles for a bit, getting to 10.25 miles, and then unlock the door and step into our unit. The time is exactly 6:30. I feel good knowing I've just logged 10 miles, with 4 more to do tonight as I'm trying for 90+ this week, and even better when I hear Noah happily yell, "Hi!" Anne and Noah are always my favorite sites in the morning. Pikes Peak is a distant second. I now have 25 minutes to make lunches for Anne and me (she makes Noah's lunch) and eat some cereal, before seeing them off and then rushing to shower, get dressed, let Sophie out again and then speed off to work--another working stiff. I ran in the Greenland Trail 50K yesterday. This was my first race in over seven months, and my first-ever race at elevation. My last race was the North Coast 24-Hour/24-Hour National Championship in Cleveland, where I completed a disappointing 131 miles. It took me about three months to get back to 100% after the North Coast 24. But that was a lifetime ago. The Greenland Trail 50K was held in the Greenland Open Space, located about 20 minutes south of Castle Rock and 20-30 miles north of Colorado Springs along Interstate 25. When I parked my car I checked the elevation on my car's navigation system and it read 6,955 feet--much higher than I thought. Before I go any further, the basics: I finished 5th overall--out of about 120 finishers--with a time of 4:14:59. 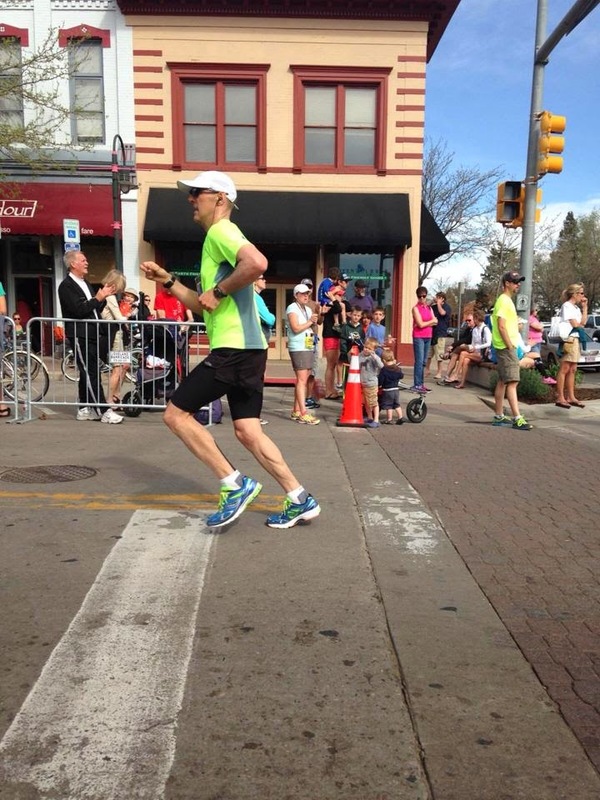 The winning time was 3:52 by a guy who happens to be a 2:27 marathoner. The complete results are here. I'll post photos when/if I get them. The course consisted of four loops within the Greenland Open Space, with short spurs entering the course and to access the finish line. According to my Garmin, the entire course was between 7,000-7,500 feet, with 3,331 of ascent and 3,336 of descent and a few decent hills but nothing steep. The trail was all dirt and mostly double-track. There was some mud and snow but overall the course was dry and in excellent condition. The weather was also pretty nice. Though the sun was out, in a few sections you really got blown around. It was about 30 degrees at the start and in the mid to high 40s by the time I finished. The Greenland Open Space offers beautiful views of surrounding mountains, including Pikes Peak. Being a crystal-clear morning, Pikes Peak looked like it was practically glowing. Some of the views were magnificent. I am not happy with that fourth-lap time. My marathon split was 3:33:12.I noticed that my quads really held up well as I was hammering the downhills. I think the weight-training is paying off. At such elevation and especially in the mountains, I think it's vital to have balanced and strong, but not overly muscular, legs. I'm doing single leg extensions--one leg at a time--with light weight and fairly high repetitions. Doing one leg at a time helps identify and address imbalances and weaknesses. I guess it's paying off because I was strong on the downhills at Greenland. Back to the race: Overall I am very happy with the result. This time only a month ago we were in the car making our way out here to Colorado from Ohio. I had lived at sea level all my life. 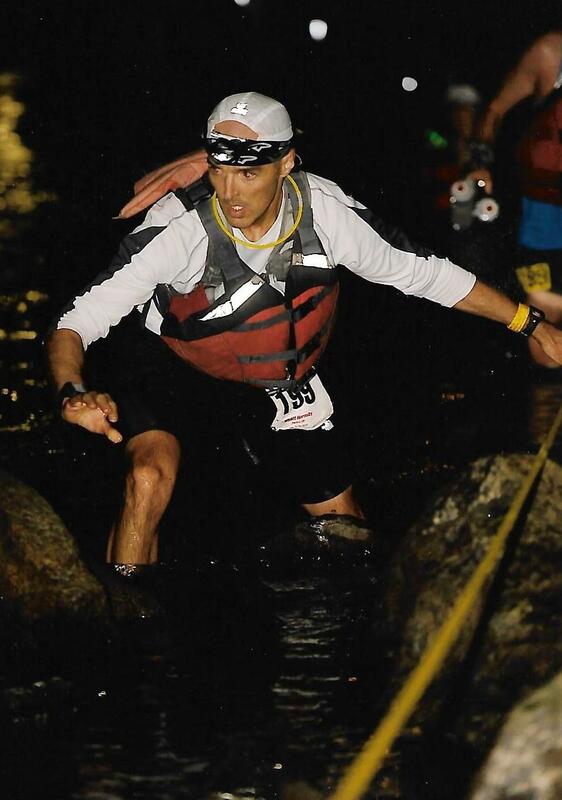 To go from nearly 37 years at sea level to finishing fifth overall in a race at 7,000-7,500 feet makes me feel upbeat, especially as I'm now preparing for the Leadville Trail 100-Mile Run on Aug. 21. My mileage over the past two months has been erratic and it's now time to get more consistent and try to hit triple digits for my Leadville training. It's hard to say what my next race will be, though I'm leaning toward the Leadville Marathon on July 3 and, by then, hope to have conquered Pikes Peak--both ways (25 miles with 7,400 feet of vertical). This week the goal as I recover from the Greenland Trail 50K is 80 miles.